My name is Venus. 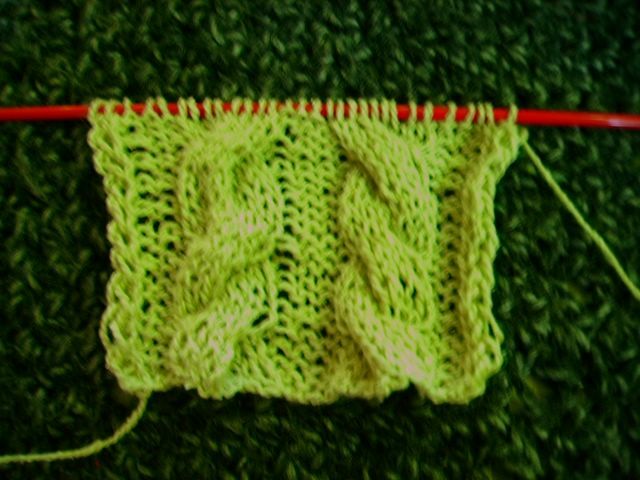 I knit as much as possible, while juggling work and various other activities. 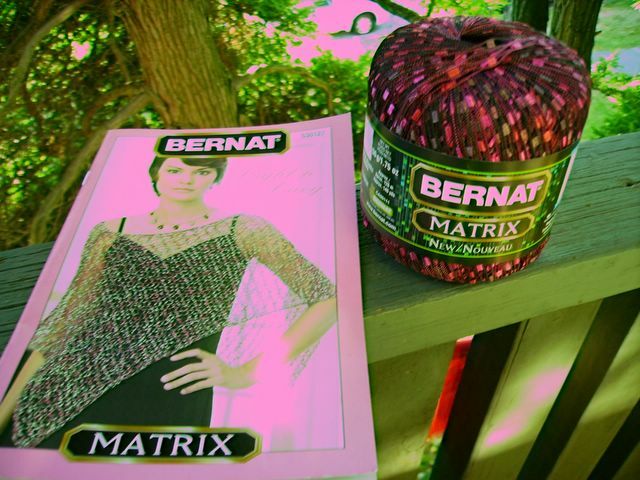 Currently, my yarn sprees hinder my ability to save up for trips and other important things. But I'm not apologizing. 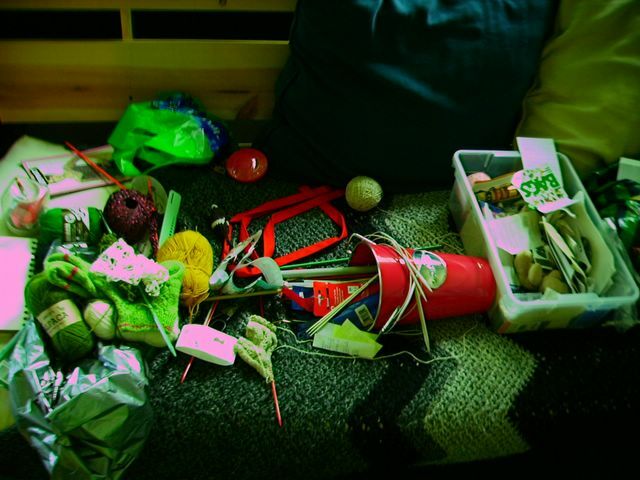 Inspired (and required) by my boyfriend's recent surge of "unclutter and rearrange the living room" I am tackling a great big clean up of my yarn "area". This "area" has grown from one full basket to a couple baskets, many bags, plastic containers, crates, a bucket.... you get the picture. It has also taken over an entire futon. And this is the main crate I need to sort out. If you look, there is some unraveled sweater yarn wrapped around my VHS case of Yellow Submarine. That's what I'm talking about. Why do my pictures have that pink glow? Must learn to photoshop. Lack of Lace Distress Signal!! Argh! I need to find a good lace pattern in a bigger project than a scarf. 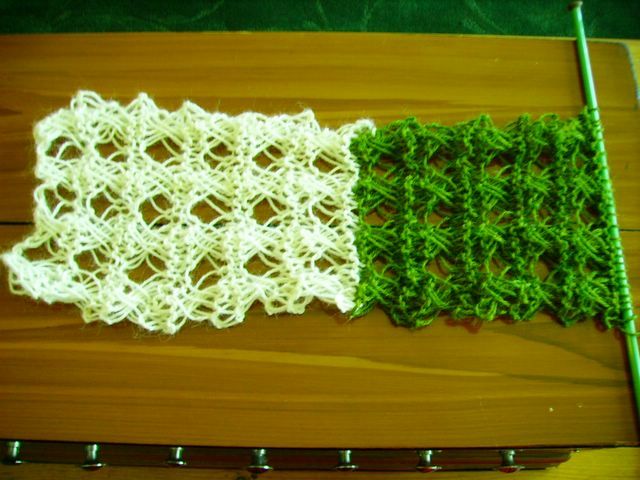 I'm thinking tank top or shawl....I am ready but I have yet to find a pattern that I love. 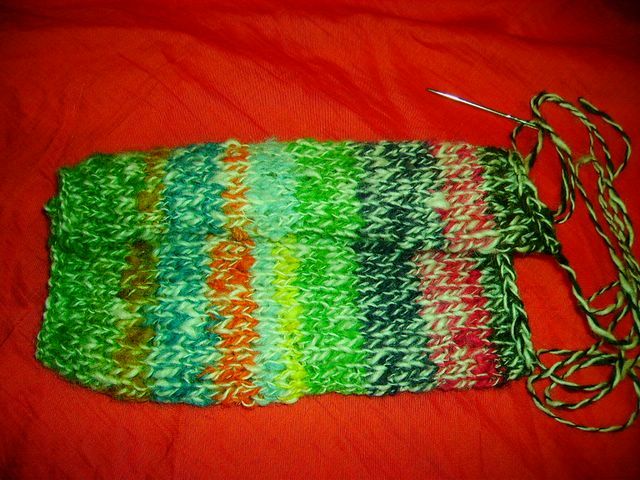 And I need to love the pattern I decide on because that's what will help me finish the project. The flower lace hoodie doesn't count because it has it's fair share of stockinette stitch. I'm talking ALL lace. Whew! My family has just left after a few days visit. It's always nice and tempermantal to see them. We went shopping (much to my dad, brother and boyfriend's chagrin) and to some more natural and less commercial places as well. And just like my mom, she rarely comes over without a gift of some sort. This time she thought I'd like to try a more different yarn. 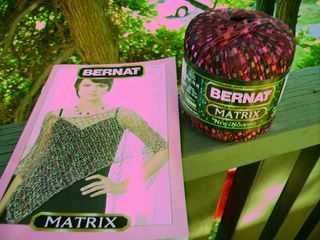 She also got me a pattern booklet for this yarn. 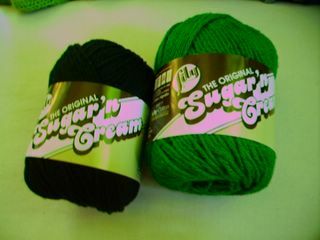 And while we were out shopping, I picked up some cotton to crochet into beanies for my brother. I've also had time to start a swatch for a pattern I may be able to figure out, from the notes I've took of a bollero/shrug while we were shopping. 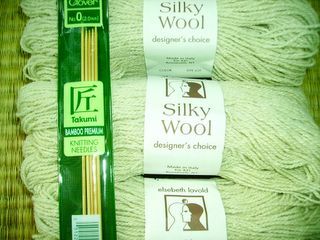 I'm thinking of using the silky wool, previously purchased without a project in mind. 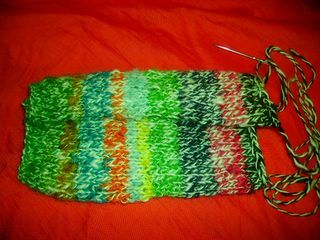 (This swatch knit on 4.5mm) I have the cables turning opposite to eachother. Do I like it? Don't know. 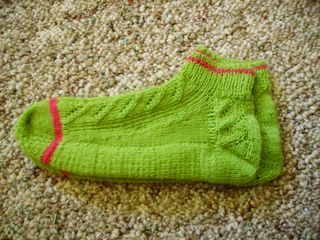 And last but not least, my second attempt at the footlets, without the double padding on soles. Kind of blury but you get the idea. It definitely looks like I've started more projects than I really need. UFO's, lets recap. Okay, well that's not too bad I guess. The bad part is when I start looking for new projects. Do I need to be unravelling my boyfriend's old sweater to knit into more socks? probably not. I also have this need to find 'homes' for all my yarn. I like to have projects in mind for each yarn, and sometimes when I find the pattern/project that is just right, I have to start it right away! 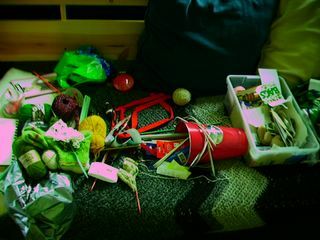 I have a couple of stray and miscellaneous balls that await small, kitchy novelty projects like..... Well, if I knew, I wouldn't be so compelled to find projects for them, would I? That's all for now I guess. 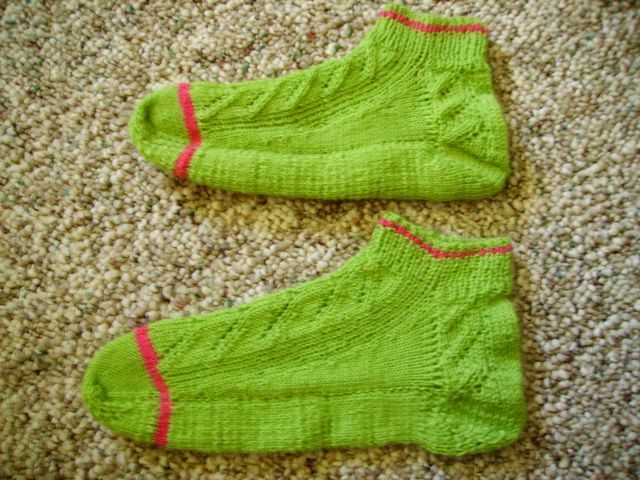 On other news the lady I knit the baby booties and toques for had her brand new baby girl early this morning!!!! So congratulations to her! What's that? Baby needs some new knits? I'm on it. This is the two on top of each other. The difference in shoe size is about a ladies 8 to a ladies 10. And here laid out next to each other. But I have already started another set of socks in this pattern. I will succeed! 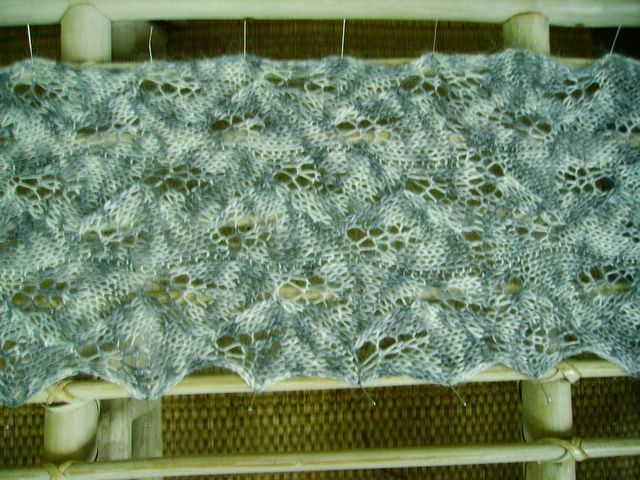 Also, I have decided to abort the antique lace alpaca scarf. I'm not feeling the scarf vibe right now. I realize that I haven't posted in a while so I come armed with pictures. 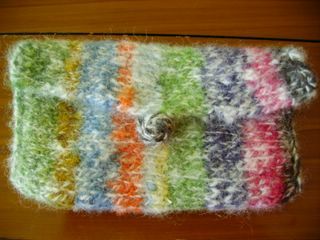 First, the finished product that is my felted pocketbook. I crocheted the button loop and the button and sewed the two sides together. 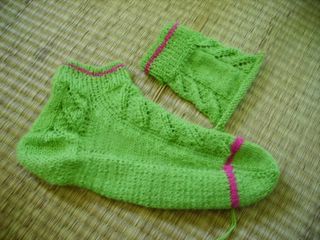 Secondly, I have been working on the footlets from the summer IK. The heel of the first sock is a bit baggy due to my loose knitting when I started knitting with double strands. I am hoping that some blocking will fix that. 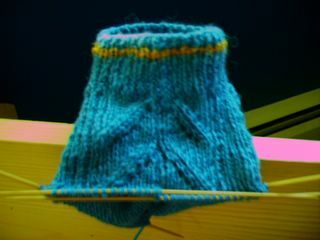 The second sock is puttering along pretty well considering I hate the second piece of any pair project. 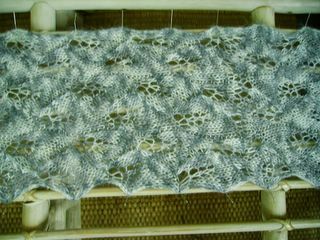 The scarf I am currently working on is the antique lace pattern from the summer VK. Easy-peasy, but I am re-thinking the two color idea. Do I like it enough to continue? We will see. And last but not least!!!!! On Thursday night I went the the Beck concert (which blew my mind!) and for one song he whipped out an instrument unknown to me. 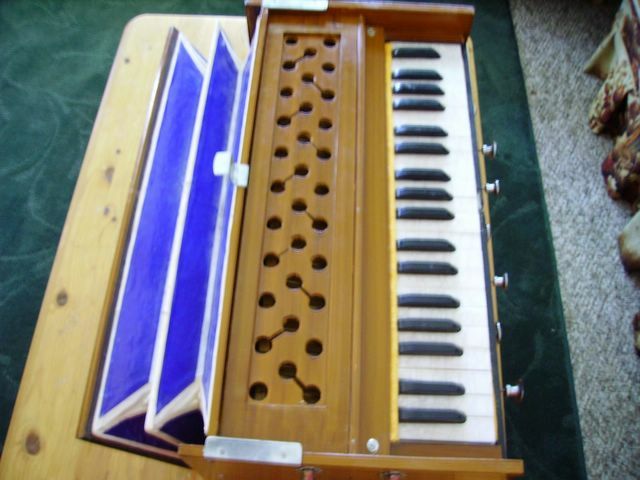 It looked like a cross between a mini organ and an accordian. 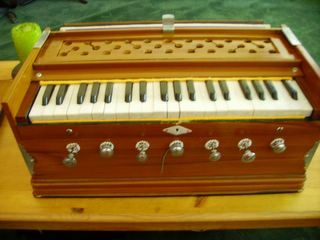 Well, I found out that the contraption is called a harmonium. I also found that there was one on sale at my local Sally Ann. What? How much? I'll take it! So here is a picture of my new toy. 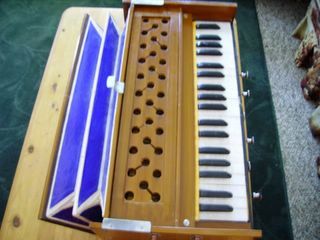 And a view of the bellows. 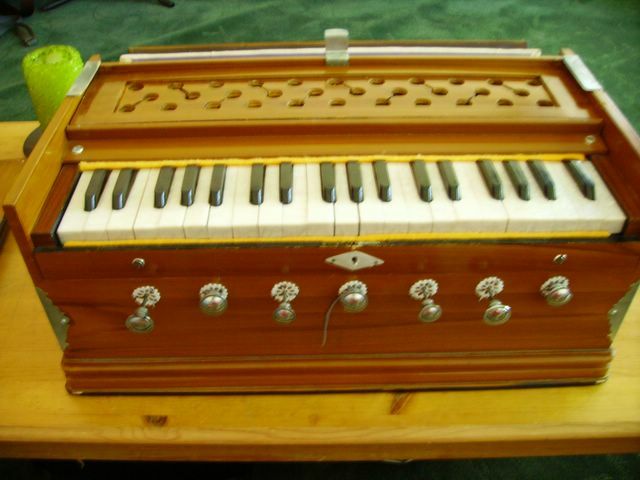 Not exactly knitting material, but music is one of my other passions. So there we are. And so ends my self inflicted ban from my LYS's. As per usual I don't know what I'll be making with it just yet, but what's important is that I have it now. 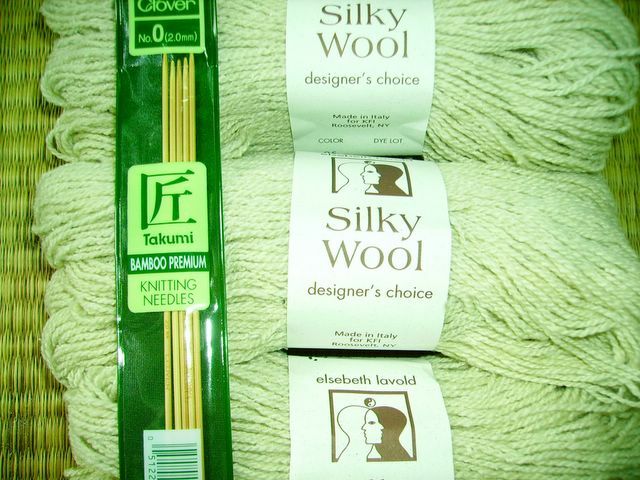 Elsebeth Lavold Designer's Choice Silky Wool. And the needles! Oh I am in love!!! I am now convinced that the reason why I haven't been able to finish a pair of socks is because of those damnable metal dpns. I have also tried circulars but I just don't have a solid feel for them. I just like dpns better. And bamboo....oh, be still my heart. 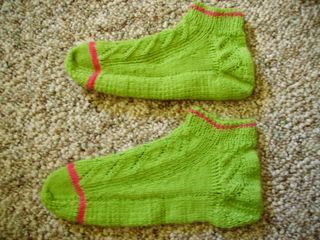 The socks I have started on (the watermelon socks, abandoned now) are the padded footlets in IK. I am patiently waiting until friday, when the fall edition comes in to the magazine store by my work. Should I get a subscription? Probably. Can I afford it? Not right now. Which won't make sense in the long run, since I will end up paying more. But I also kind of like the hunter/gatherer feel of having to go find my own copy. I know I said patiently waiting, but I hate waiting. I am all about instant gratification. Satisfy me now!!! 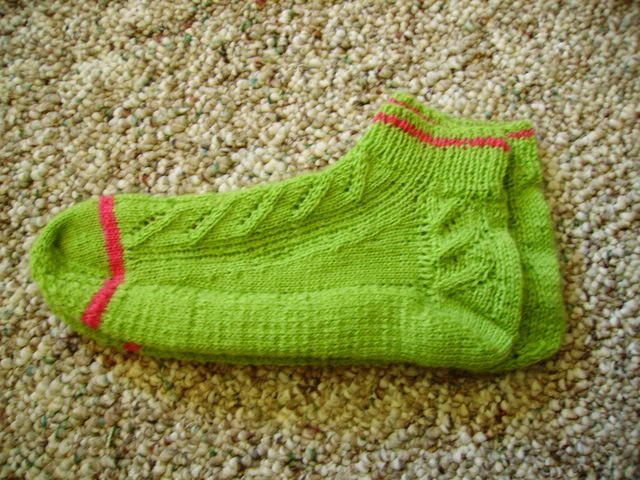 I have to go work on my footlets now! Here's a quick shot of my scarf being blocked. In a somewhat unconventional way, but what can I say, I like to be resourseful. Hopefully today I will get a chance to pick up more material to put together a new hand spindle. The one I have right now is also an unconventional/resourseful creation. I'd like something a little bit lighter, and not made out of a teacup stand. Oh wait I have a story about that. A few months ago I had taken a spinning class that taught spinning on the wheel and the hand spindle. I couldn't (and still can't) afford a wheel so I was going to purchase a hand spindle. I came across a teacup holder and converted that into my current spindle. My boyfriend, never having seen a hand spindle before, assumed that I had created the thing, idea and all out of my own fantastic imagination. (In retrospect, how sweet of him to think I had the brains to invent something like that.) About a week ago, he comes home from working at the library. He tells me that he saw an old spinning book and flipped through it to see if I'd like to read it. What would he come across but...gasp! A hand spindle! He was so excited. " It was just like the one you made! It had the little hook and everything! Can you believe it?" I hadn't realized that what he meant when he said that my teacup spindle was a good idea, he meant the whole idea of the spindle. I told him that people had been spinning like that since way back when. 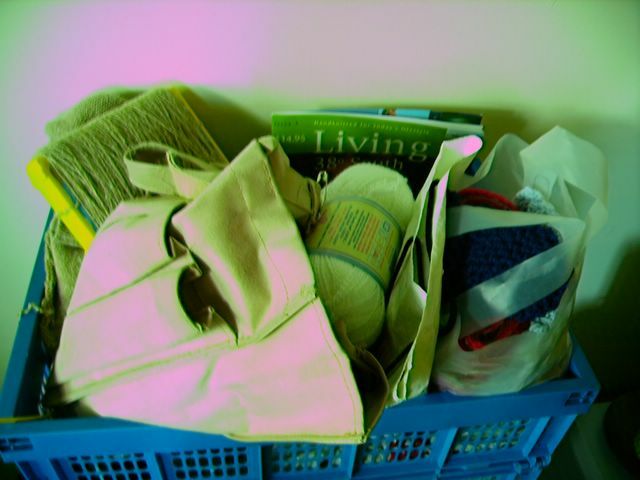 How's this for tidying the yarn basket? 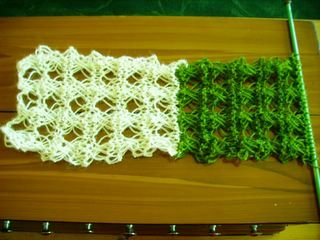 I am currently blocking my silver lace leaf scarf, so while that is drying, I whipped this little baby up. If you'll look back, I knit this soon-to-be purse/pocketbook with the rainbow yarn I spun. I think I will felt this piece as well. 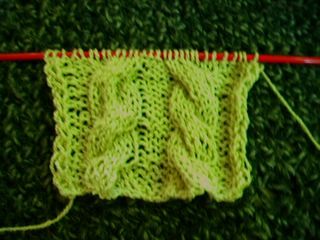 The task I must bring myself to do next, is to frog a 90% finished minisweater I had abandoned due to lack of co-operation on the sweater's part. Argh! Well, I won't wear it otherwise and it will sit on the floor unloved. I'll make sure to blog my progress on that. Does Anyone Know What This Means?